Chasing the Light: An Artistic Journey Down the Colorado in Grand Canyon is a video for those seeking artistic adventures in painting, photography and music. However, non-artists also greatly appreciate this high-definition Grand Canyon documentary. 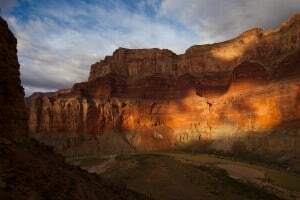 The film features an assemblage of painters, photographers and musicians on a 21-day raft trip through the Grand Canyon. Ed George filmed Chasing the Light for Arizona Public Television in 2010. He stunningly captures the colorful, brilliant cliffs of Grand Canyon and the sparkling, unbridled waters of the Colorado River. George compiles a wonderful collection of images and commentary on natural light photography and painting. In addition, the film includes commentary on the challenges of creating art in Grand Canyon. Most noteworthy, the film adds moments of high adventure rafting and scenes of just plain fun. The late Ed George contributes to countless thrilling documentaries. He films electric eels in Brazil and crocodiles of the Orinoco River in South America. He captures Anacondas in Venezuela (nominated for an Emmy in 1999) and the giant Gaboon viper in the Congo Region of West Africa. Most of all, the light in the Canyon provides great inspiration for both creative minds and personalities. Mercurial moments of inspiration intersperse the scenes. Viewers of this film appreciate the “eye” of the artists and the enthusiasm of the musicians on this inspirational journey. Check out the trailer for a sneak peek into Chasing the Light. Like what you see on the AzRA blog? Sign up and receive an email notification when a new article posts on the AzRA blog. Email is only for article notifications.